Investment in the EU has been declining since the outbreak of the global financial crisis. While Europe was indulging in self-destructive austerity, China was inter alia building a huge high-speed rail network. Given the big weight of German public investment in the EU, it is pivotal that Germany reverses the course of its fiscal policy. In this column we suggest a coordinated pan-European infrastructure investment project inspired by the Chinese Belt and Road Initiative – the ‘European Silk Road’. It is suggested that capital formation in CESEE countries is insufficient for safeguarding a sustained income catch-up with the developed countries. The recent slowdown in investment growth which started in 2009 yet cannot be blamed on inadequate investment profitability. In fact, profitability is generally much higher than in the years 1995-2005. 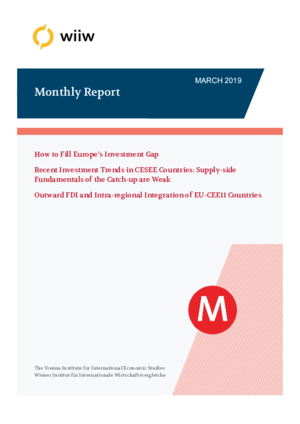 Outward FDI is still of much smaller magnitude than inward FDI in EU-CEE11, while the net FDI position is only loosely linked to the level of economic development. The level of outward FDI has increased over time but not in all countries of the region. A significant share of outward FDI has been within the region but the share of intra-regional investment has declined in the case of the larger investors.